... An impulsive and foolish thing for a child to do alone, but luckily for her Nightwing is able to track her and Mr. Zsasz (the man responsible for the death of the girl's parents) down. The attitude and ferocity with which the girl has towards Zsasz is kind of adorable except when you remember the larger picture and the giant, evil man standing opposite her who's not afraid to cut her down. 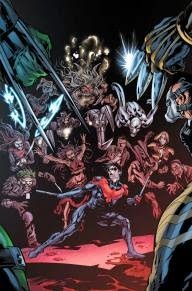 In the story there is also a retrospect on Nightwing's life that highlights his many ups and downs with personal relationships and his super-hero work. Nightwing is trying to re-affirm his identity. This was a sweet issue to read. The story relates that there will be failures and shortcomings you'll have in life. It will all be a struggle, but hopefully in the end, you can find a bit of peace and be happy with who you are and the choices you've made. I liked the themes and the way they were executed. I felt like the artwork was a little bit rough at times but got better as the story progressed. The story wasn't filled with any mind-blowing revelations, but not all stories need to be filled with so much shock and awe. Sometimes, they just need to be a good story.